Product #26693 | SKU 8404B002 | 0.0 (no ratings yet) Thanks for your rating! 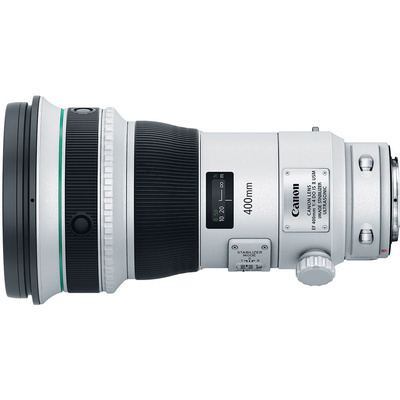 Featuring a unique optical design and paired with advanced image stabilisation technologies, the Canon EF 400mm f/4 DO IS II USM Lens is a super telephoto lens designed for full-frame EOS DSLRs. Gapless dual-layer diffractive optics are employed within this lens' construction to produce a smaller, lighter weight 400mm option with enhanced correction for chromatic and spherical aberrations. Aspherical and UD elements are also utilised to further reduce distortions and optimised coatings contribute to increased clarity and contrast. Complementing the sophisticated optical layout, a four stop-effective Optical Image Stabiliser helps to minimise the appearance of camera shake and can be dedicated to different styles of shooting. Ideally positioned as a versatile option for sports and wildlife photographers, this lens' high-performance attributes and natural handling render this a viable telephoto option for a variety of applications. One large diameter ground aspherical element and one Ultra Low Dispersion (UD) element minimise aberrations and distortions while also contributing to greater sharpness and clarity. Optimised lens coatings help to suppress lens flare and ghosting for increased contrast and more colour-neutral imagery. An Optical Image Stabiliser helps to minimise the appearance of camera shake by up to four shutter speed stops to better enable working in low-light conditions and with slower shutter speeds. Additionally, three dedicated image stabilisation modes are available-Standard, Panning, and During Exposure Only-and can be selectively employed to suit a variety of types of shooting. Furthermore, the image stabilisation system does not need to be disabled when shooting with a tripod.